Our guide to Chimney Pots offers detailed descriptions of companies such as Whitecaps and The Fireplace and Chimney Store. Importers of antique chimney pots from England, plus a full range of architectural items salvaged from England and France including butlers sinks; original, red English telephone boxes; reclaimed stained glass; Gothic garden seating; and antique gates and wrought iron pieces. A full line of lightweight chimney pots, chimney caps, chimney toppers and other enhancements that are designed to be easier to install than traditional clay chimney pots. Supplies terra cotta chimney pots from major manufacturers, as well as antique and custom products. Online retailer sells chimney caps in stainless steel and copper in many designs and styles, including custom. 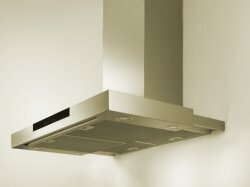 Wall-mount range hood slides out to extend ventilation area.